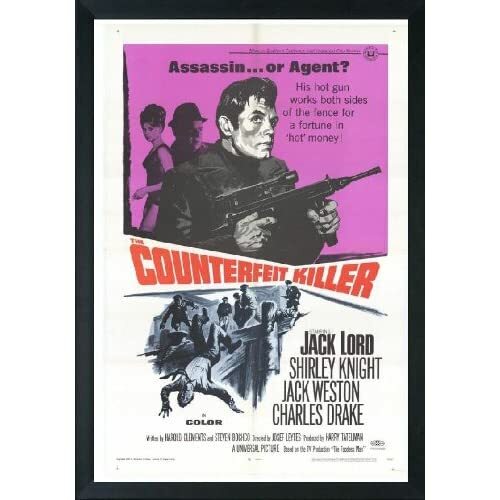 The Counterfeit Killer (1968) aka Crack Shot. Starring Jack Lord as Don Owens. Video includes opening credit and entrance scene of Jack Lord. Buy the movie poster, click here.? Counterfeit Killers which is also known under the title of Crack Shot stars Jack Lord. A man is found dead in a sleazy dockside bar. It happens that he was an Olympic Swimming Champion. On the other side of town police discover that counterfeit dollars are being passed in the central areas, drugs are pushed without hindrance. A hit man is hired to fulfill an important contract. Another murder is committed on the dockside. One thing is certain, all the evidence on each count is connected. The conclusion being that the mobsters have hired a Crackshot. Starring Jack Lord, Shirley Knight, Jack Weston, Charles Drake, Joseph Wiseman, Don Hammer, Robert Pine, and Mercedes McCambridge.? The soundtrack is by Quincy Jones.